Unknown item consisting of lengths of linen(?) straps and buckles in a T-shape. On the longest length red lines have been drawn. With the remains of black rubber(?) at one end which had white numbers printed on it, only an 8 can still be seen. 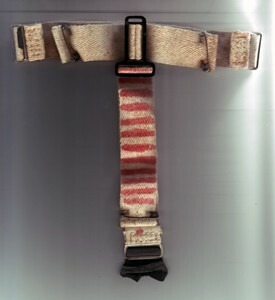 Belonged to Private A.L. Lloyd, R.A.M.C.